Max is gone. Every one of our four boys had the honor of climbing on Max’s back. You think you’ll remember all this stuff, and you probably will. But right now it’s current, and life flows, and these events will drop away to give way to new current events. But watching your life in video form makes you an observer of your own experience. You become the witness of your life, and you keep it current. In this video, we realized that Max was a time marker. He went through life so quickly, and we are aging much slower than him, and we hardly notice what’s happening. Max was 13 , carried tumors, and could no longer run. It was painful to watch him try to walk. My husband tried to avoid it as long as he could, as we were busy packing 4 kids for an 8 our plane trip to Idaho — my husband nervous about competing in his first Ironman (hence the trip). And due to our nature to put this off as long as we could, this was the day it was going to happen. Things were crazy, hectic, and nobody had time to grieve Max. Our 4-year old, knowing that Max would soon be leaving us — started asking me questions. Did Max have any birthdays? Did you know that, one time, I saw Max RUN!! He was pleading Max’s case. Maybe Max isn’t OLD. In his eyes, he had only known four years out of the 13 years of Max’s life. He didn’t know what Max was like as a puppy, or what he looked like when he ran. And how much different Max is today. I answered my 4-year-old’s questions with a DVD of Max’s life. And, it gave us a chance to grieve. Fast forwarded 13 years into minutes. As you watch you realize how fast time is moving every minute, while gently showing my 4-year old how Max used to be, and it’s time for him to move on. I just had to tell you that your 1 minute video was powerfully poignant! I adopted two MIDLIFE brother/sister golden retrievers from ‘rescue’ two years back, that bonded instantly and profoundly in a way I’d never imagined possible. They are SO appreciative and thankful to be adored and loved that they’ve already seen me through some MAJOR life storms I’d never thought possible without my ‘old guys.’ Hang in there. And thanks for also posting the ‘converting tape to digital’ link. My heart goes out to you and your boys for the loss of their beloved ‘puppy’ . 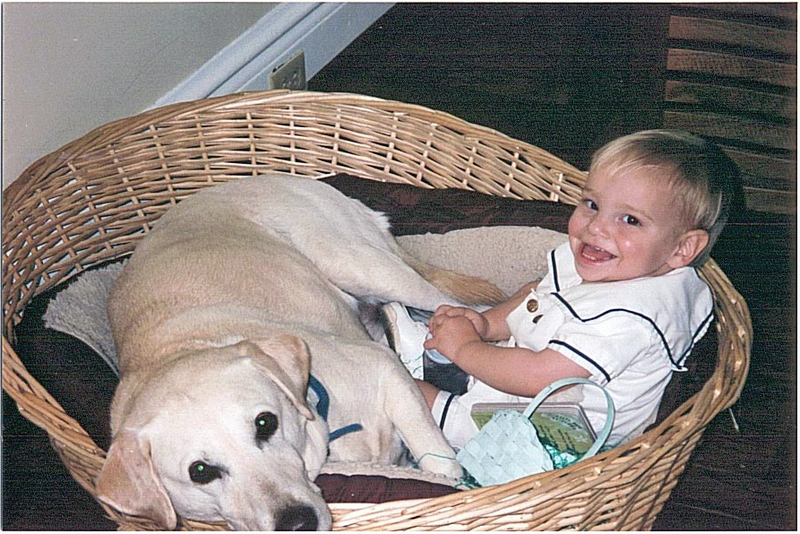 i say puppy because he seemed just like another boy , playing joyfully with your children all of those precious years. I hope Colin gets to enjoy Lula the chihuahua for as long as you lived with max. Even without the music it brought tears to my eyes. Loved seeing him frolic in the waves, and your son climbing on him. Reminds me so much of my kids with Bone, our golden retriever. He’s going on 12 and we’ve had him since he was 4. He’s slowing down, but still doing well. Sorry for your loss, losing beloved pets is so very hard, I lost my Sassy last June (cat I had since she was a bottle fed kitten) and it still hurts. Lasireneserene: I think you’ll get your wish. Mandy: I’m so happy he’s doing so well. That’s pretty good for 12. Sassy — what a great name for a cat. Oh, glad you are feeling better. Now, on to my question: HAHA. Do you have any idea how to take vhs to youtube or will that solution present itself once I get them to disc?? I have a camera which is vhs but has digital signal processing which a friend said makes it digital. hmmmm. If I could find the manual I suppose I could figure it out. If it will take you too long to answer please overlook my query and keep posting your cool thoughts but if you know another lil program (i have an old dazzle but unable to find the updated software) … that will help such as the ulead you mentioned, that would be great. And, carry on … I love stumbling into peoples’ cool ideas. Thanks Vox for the well wishes. Yes. It will take care of itself, once you get it to disc. Once you have your “file” in your computer, convert it to MPEG (a feature on your software), and that is the file you upload into YouTube when it asks. Your old software will still work — but if you want to upgrade, I like Ulead and Magix — I’ve used both. It took a long time and trial and error for me to learn how to do – the software manuals are not very helpful. So, if you feel frustrated — it’s normal — and it will come. Both of these software programs are very intuitive, and the answer to a problem you’re having will hit you in the middle of the night. But do convert!! The tapes deterioriate. And, unfortunately, I just read that recordable discs only last 5 years — so keep them on a hard drive, or remind yourself to re-burn them to new discs. keep on keepin on ….